PRINCETON, N.J. -- Americans' confidence in the police has edged back up this year after dropping last year to its lowest point in 22 years. Currently, 56% of Americans have "a great deal" or "quite a lot" of confidence in the police, four percentage points higher than in 2015. Confidence is essentially back to where it was before a series of highly publicized incidents involving white police officers and young black men in several communities across the country. The latest update on Gallup's annual measure of confidence in U.S. institutions, conducted June 1-5, finds Americans' overall confidence in most institutions below the historical average, a pattern that encompasses the police, despite the small rise in confidence this year. Still, confidence in the police is high on a relative basis, lagging behind only the military and small business on a list of 15 institutions. 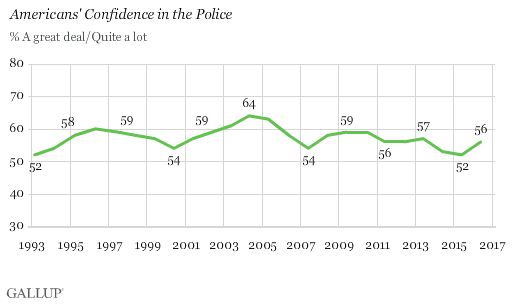 Americans' confidence in the police was at 52% when Gallup first measured it in 1993. This rating reflected the impact of the trial of four Los Angeles police officers for beating Rodney King and violating his civil rights two years earlier. Confidence in the police rose thereafter, reaching 60% by the mid-1990s and a record high of 64% in 2004. In the ensuing years, confidence in police slipped, as it did for most institutions. Last year, confidence tied the record low of 52%, reflecting police actions in Ferguson, Missouri, and other cities, before rebounding modestly this year as these events faded from the news. At this point, 25% of Americans say they have a great deal of confidence in the police, 31% quite a lot, 29% "some," 13% "very little" and 1% "none." 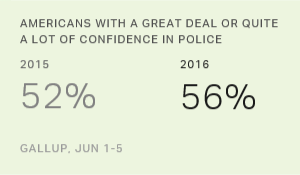 The combined 14% who have very little or no confidence in the police is down from 18% last year, which was the highest negative confidence reading in Gallup's history of rating the police. As has been true historically, whites have a significantly higher level of confidence in the police than nonwhites, and the gap between the two racial groups widened this year as whites' confidence rose to 62%, while nonwhites stayed at 39% both years. Republicans and independents who lean Republican have more confidence in the police than Democrats and Democratic leaners, although Democrats' confidence rose to 48% from 41% last year, while Republicans stayed the same both years at 68%. A slim majority of Americans have confidence in the police as an institution, and that confidence level has risen modestly since last year's low point, which most likely reflected the visibility of police incidents involving black citizens. The continuing gulf between whites and nonwhites in confidence in the police, however, has increased -- reflecting the tension that exists between the police and some communities, a problem that will almost certainly take years to address in meaningful ways.